Finally the rains have decided to pay us a visit and the temperatures have dropped, it’s cool but a bit humid and the evenings are very pleasant. A rainy day calls for pakoras, soup or some delicious hot dal (lentil curry). I decided to make mixed dal with rice. I love making mixed dal because it does taste different from the other dals. 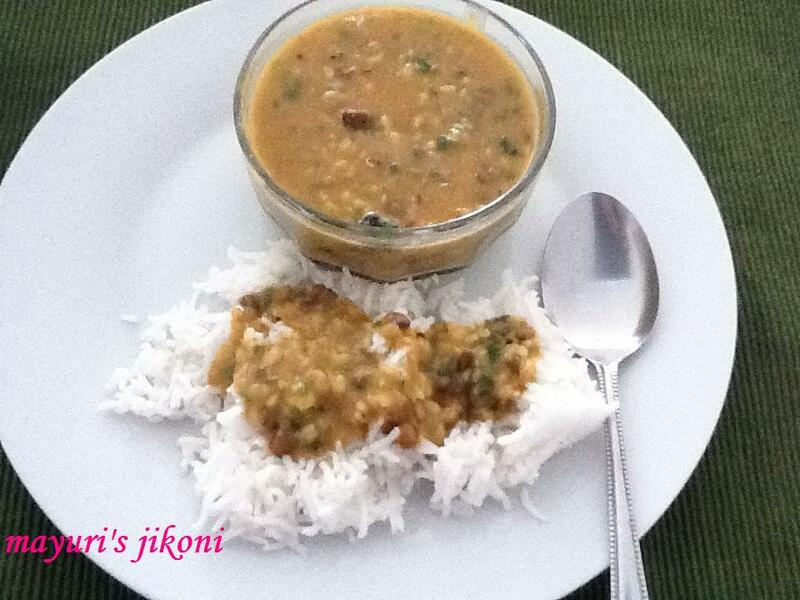 This dal is also known as panchmel, panchratna or panchkuti dal. This simply means a mixture of five different dals or lentils. Don’t need to soak any of the lentils overnight. Different regions of India make mixed dal in different ways. Some add more onions or more tomatoes. Some make it really spicy. Some make it a bit watery or some make it pretty thick. I love it a bit thick with not too many spices. You can adjust the spices, onion, garlic, tomatoes according to your taste. All the lentils are readily available in any Indian grocery store. 1. Mix the lentils in a big bowl. Wash the lentils and soak it in 2 cups of warm water for 30 minutes. 2. Put the lentils along with the water into a pressure cooker. 3. Add 1 tsp oil and half the turmeric powder to the lentils. 4. Cook over medium heat for 3 whistles. If you don’t want to cook the lentils in a pressure cooker then put them in a deep pan along with the water, 1 tsp oil and half the turmeric powder. Let the mixture simmer over medium heat till the lentils are done. You may require more water. 5. In a deep pan heat the remaining oil and ghee over medium heat. When it becomes hot, add mustard seeds, cumin seeds, bay leaves and kokum. 6. Add the chopped onions and stir fry them till they begin to turn light brown in colour. 7. Add garlic, ginger and green chilli paste. Stir fry for a minute. 8. Add remaining turmeric powder, garam masala, red chilli powder and dhana jiru powder. Mix well. 9. Add tomato puree and cook over low heat for 3 to 4 minutes. 10. Add salt and the cooked lentils. minutes. Remember to stir the lentils occasionally. Add amchur powder and mix well. 12. Add chopped fresh coriander and serve with hot rotis, parathas or rice. Use 1 tbsp lemon juice instead of kokum. Add the lemon juice just before serving. For a more spicy curry add more garam masala. For fresh tomato puree, boil or steam 3 to 4 tomatoes and puree. Garam masala and dhana jiru is readily available in all indian grocery shops.